We are engaged in offering Regular Compartment Tray to the clients. Fostered with enormous business understanding of this realm, we are involved in presenting a broad consignment of CWC Stainless Steel Oval Compartment Plate. 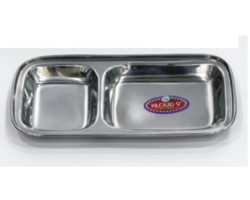 Stainless Steel Thali With 3 Compartment For Tender. Compartment Plate with 4 partition are of round shape tray. 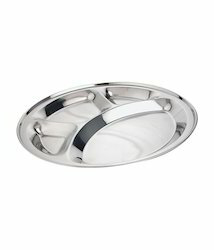 These trays are made of quality stainless steel. We offer a variety of Stainless Steel for cooking and serving food.Made from stainless steel, these are durable, and are best for safe food keeping. We are offering 3 Compartment Thali to our clients. With enriched market experience, we have been able to offer a wide spectrum of Stainless Steel Divided Dinner Plate.